Leading up to the game's November 20th release date, Nintendo intends to send out regular emails detailing some of the finer points of The Legend of Zelda: Skyward Sword. They did so again this Friday by rolling out information concerning the new Whip item and potions. There's more, of course, but we'll lead the body of Nintendo's email do the talking. One part of the note included information concerning how Wii MotionPlus will figure into controlling link while swimming and while wielding the new whip. While the text from the big N doesn't necessarily explain exactly how MotionPlus will be used to the end of precisely controlling Link, they do give a brief spot of insight. 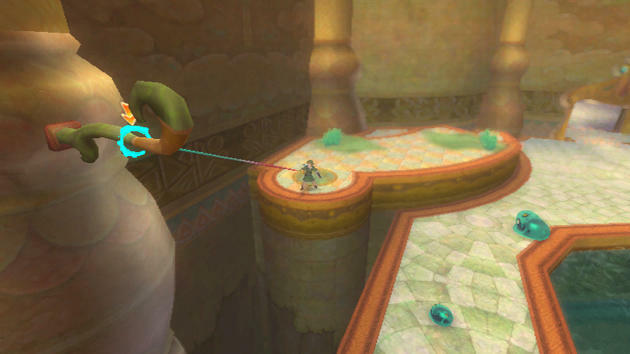 Whip: Players can use the Wii Remote Plus to lash Link's whip at enemies and objects. The whip also can be used to grab items and is integral to solving certain puzzles. Link's items can be selected in real time without pausing the game when he is on the ground, making it easier to switch between a sword and other items. Swimming: As one might expect, getting to and exploring Lake Floria requires Link to swim. The intuitive motion control of the Wii Remote Plus gives players a natural way to control Link as he swims across the lake's surface or into its watery depths. Fun Fun Island: Also new in The Legend of Zelda: Skyward Sword is Fun Fun Island, one of the small islands that float above the clouds near Link's hometown. As the name suggests, there's a lot of fun to be had there, but before Link can enjoy everything the island has to offer, he must find a way to fulfill the request of its lone inhabitant. You can bet Nintendo will present even more concerning The Legend of Zelda: Skyward Sword as November 20th nears. Will you be snagging this Wii title?